Thus how I described David Ro – the main character of our book Rock Testament we published this May. Well… they all real, my characters. They even have their own life. Like David himself who moved to India just like it’s been written. And he was staying there a pretty long time. He was saying that he wouldn’t leave India, he was feeling pretty happy there, but once when he was sleeping in a jungle he woke up because elephants were looking at him…and that made him decide to come back. Anyway I just put together all those whom I knew in this city and just drew the story. Dalton Sharp interviewed Eugene Zhilinsky and Kimberley Whitchurch about their book (our book!) Rock Testament at Sequential | Canadian Comics News & Culture. Some books still available in our shop on ETSY. Slava_03, a photo by ezhilinsky on Flickr. 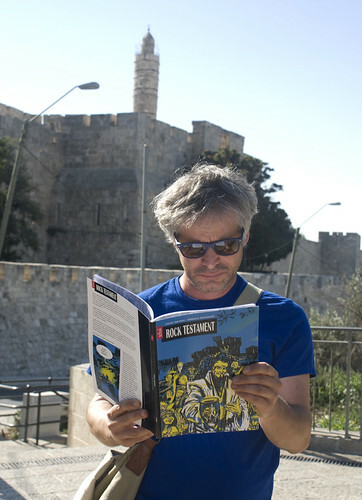 Slava from Jerusalem sent this pic with him reading Rock Testament. Perfect match of towers! Guess what? We going to reprint this! We’re just this close to! The cost of new reprint will be 12 $ compare to hand made one. Cheep! 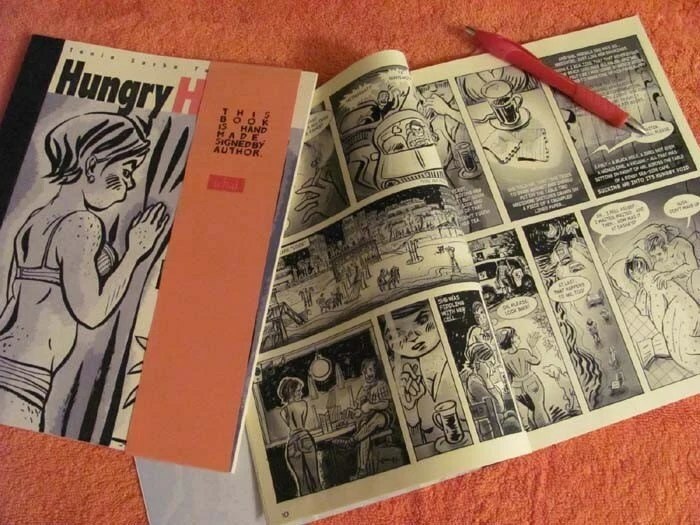 Sequential | Canadian Comics News & Culture. Kate Beaton is the cover feature of the latest issue of Quill and Quire, the magazine of Canadian books and publishing news. This week we – with Kimberley Whitchurch – were being interviewed by Dalton Sharp for Sequential | Canadian Comics News & Culture.